Beginning 1/27/2015, all YS480 and YS640 cookers shipped from the Yoder Smokers factory, will have a new thermocouple and mounting location. The thermocouple will now be a reduced length probe that will be positioned on the hopper wall instead of the bottom left corner of the back wall. Because of this positioning, a firmware (program) revision has been developed to properly calibrate the temperature offset between center grate and the thermocouple location on the hopper wall. Other than the offsets, there are no changes to the program or how the program functions. This firmware (program) revision will not function with any YS480 or YS640 manufactured prior to 1/27/2015. This factory production change does not impact how the YS480 or YS640 perform or function. The original thermocouple will be supported through 12/31/2018, at which time a retro-fit kit will be available to install the reduced length probe thermocouple and the firmware (program) revision. Thank you for your continued support and for being a part of the Yoder Smokers family! How much is the new thermocouple going to cost? No pricing has been officially announced, and the new thermocouple is not available for sale individually at this time. The new thermocouple, like the old, is warrantied for 3 years. The new thermocouple will not function in any YS480 or YS640 built prior to 1/27/15. As the announcement states "This factory production change does not impact how the YS480 or YS640 perform or function. The original thermocouple will be supported through 12/31/2018, at which time a retro-fit kit will be available to install the reduced length probe thermocouple and the firmware (program) revision." The new thermocouple is a factory production update, not a factory production upgrade. Herb my question is why was it moved and what difference does it make in performance if you can share that information. Through the hundreds of hours of testing that were accomplished, the new thermocouple matches, and does not exceed, the performance of the current thermocouple, other than the intrinsic value of having it further away from the cooking grates and the influence of objects placed in the cooker. Any chance that a retro kit will be made available before 2018? I'd prefer not to wait that long. Did I miss it......or has there been an announcement already on the new diffusser for the YS640 or maybe a change in plans? No news on the deflector front. Yoder_Herb wrote: As most of you likely heard, we are implementing a small price increase on 09/01. 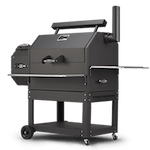 We have engineered a few new pieces into the pellet grills that will give you longer service life. We have introduced a new burn grate that will not change shape under prolonged heat exposure, and will have these available for sale to current owners in the next several weeks. We also have a couple of additions that will release next week. WHAT IS THE PRICE FOR THIS NEW BURN GRATE? Any update on the diffuser plate before I weld some angle in place to keep it straight? Fleetz wrote: Any update on the diffuser plate before I weld some angle in place to keep it straight? I have been informed by another Yoder user that Yoder have modified diffuser plates that ensure they won't warp having some steel welded to the underside. Can someone at Yoder confirm this and if true post up some pictures? There have been no official announcements regarding a modified diffuser plate, other than what is contained in this 4 page thread of announcements. 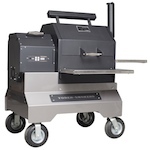 Whenever there are official product announcements from the Yoder Smokers factory, they will be posted on the forum first. 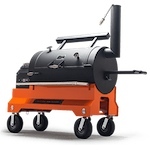 Yoder Smokers continually works toward improving products, based on customer feedback, and forum users will be the first to know about changes, update and new products. Herb, can Yoder make me a new diffuser plate with reinforced bars to ensure no warping occurs at any temperature? Could they also add a handle of sort on each end to help with the removal of the diffuser for cleaning? I don't have the necessary equipment or know how on doing it myself. Please. I have passed your request on to the custom fab person. The new OPTIONAL 2 piece heat diffuser for YS480 and YS640 has been released and is ready for shipping! I love this upgrade! Does this work with the older fire box or should it be upgraded too? Don wrote: I love this upgrade! Does this work with the older fire box or should it be upgraded too? This optional heat diffuser will work with any YS640 or YS480, without the need for any prior modifications. ... This is really cool. I assume i can now grill without removing the entire diffuser plate. Your assumptions is correct, if, you follow the safety precautions in the included instructions. 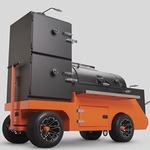 I ordered a YS640 on November 9th and am waiting for delivery of the smoker. Will mine have the improved diffuser plate or do I need to order it?